Elevate a simple dish by tossing them with a delicious pesto! These Boiled Cilantro Lime Potatoes are fantastic for any occasion. 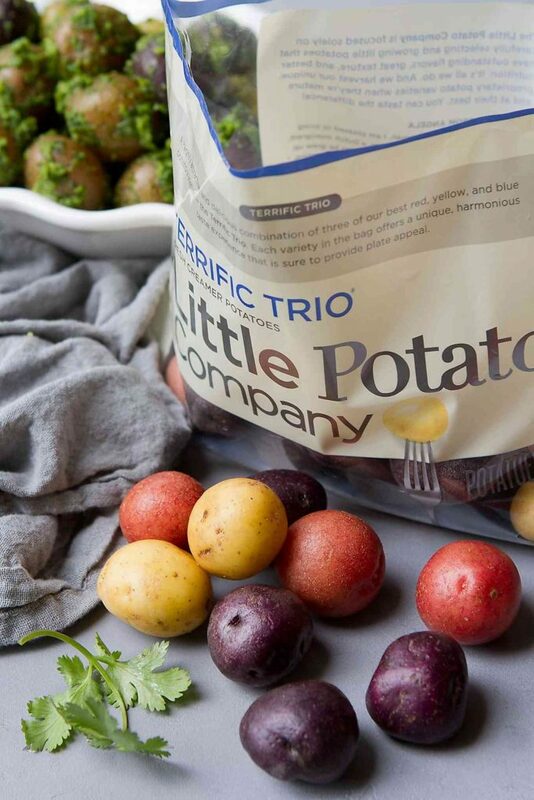 Thank you to The Little Potato Company for helping me share this recipes with you. 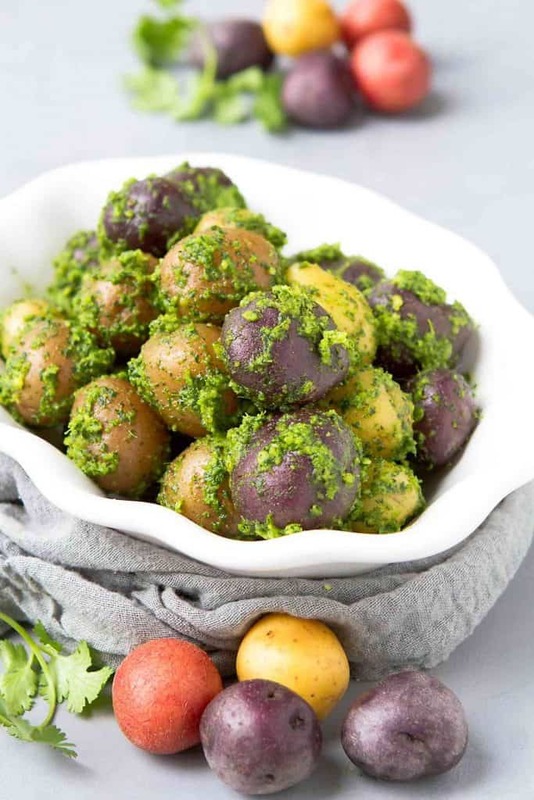 Boiled Cilantro Lime Potatoes are the prime example of a few simple ingredients coming together into a side dish that just might steal the show. A squeeze of lime juice, a large handful of cilantro, some diced jalapeños and a drizzle of olive oil meld together into a pesto that’s the color of spring, with a decidedly kicky flavor. While this healthy potato side dish is fantastic served warm, alongside a Sunday roast or baked salmon, it is equally good at room temperature, which makes it ideal for summertime picnics and backyard grilling. One thing I’ve learned from many cooking successes, and just as many cooking failures over the years is that short ingredients lists mean one thing…high-quality ingredients are essential. In this case, that means perky cilantro, a fruity olive oil, fresh lime juice and flavorful potatoes. If you’ve visited here before, you know that I’m a fan of The Little Potato Company Creamer potatoes. 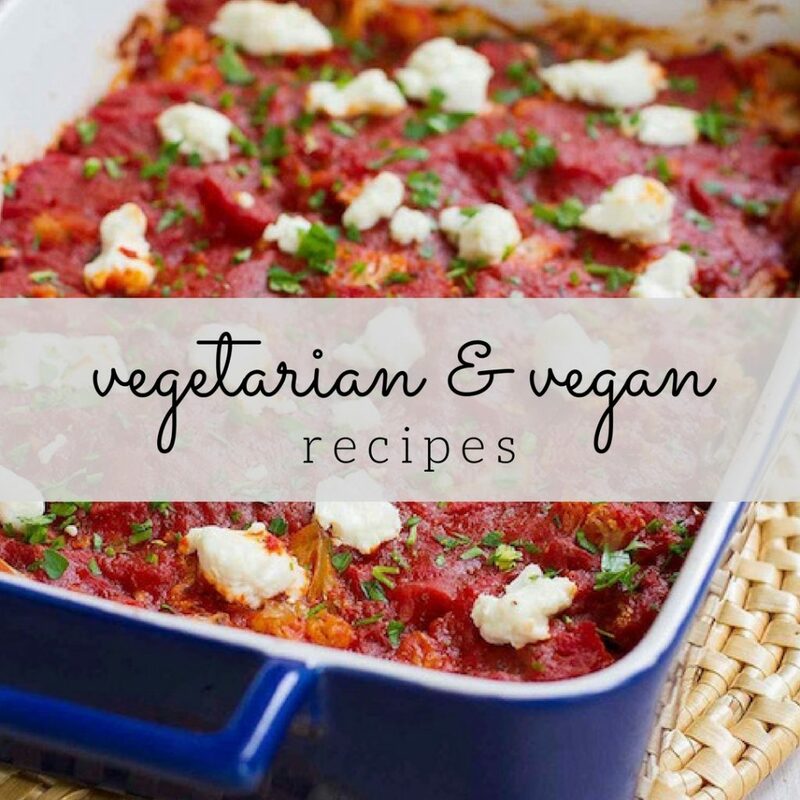 I use them in everything from vegan soup to turkey meatloaf! They’re little size means that they don’t require peeling and in the case of these cilantro lime potatoes, I don’t even have to cut them. Now that’s weeknight efficiency! And the bonus? They’re healthy! 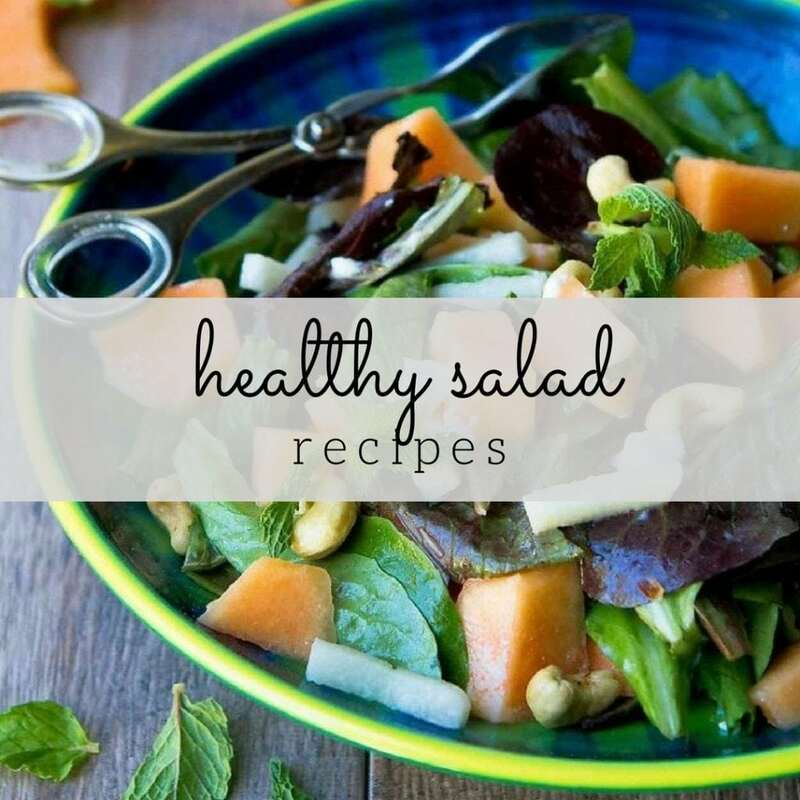 And if you’re like me, you’re thinking about healthy recipes at this time of year more than ever. Each serving of the Creamer potatoes contains potassium (19% of the daily intake! ), fiber, iron and Vitamin C.
Since the potatoes are small, they only need to be boiled for about 15 minutes, or until tender when pierced with a fork. Take care not to overcook them. You don’t want potatoes that are falling apart! For the cilantro pesto, toss the cilantro, toasted slivered almonds, garlic, diced jalapeño and salt in the bowl of a food processor. Pulse until combined. Next, drizzle in the olive oil and fresh lime juice until smooth. Scrape down the sides of the processor as necessary. Last step…toss the boiled potatoes and the pesto together in a bowl. Serve warm or at room temperature. In the bowl of a food processor, combine the cilantro, almonds, jalapeno, garlic, salt and pepper. Pulse until combined. Place the potatoes in a large saucepan and cover with cold water by 1 inch. Bring to a boil, reduce to medium-high and cook until the potatoes are tender when pierced with a fork, about 15 minutes. Take care care not to overcook so that the potatoes do not start to fall apart. Drain. Oh yum, I love anything with cilantro! What a beautiful dish! I love the color trio used and the flavors. Perfect warm or cold! Wow, that color and the flavors sound epic Dara! Love this combination of flavors, Dara! Cilantro lime anything for me! These sound addicting! What a delicious side dish! 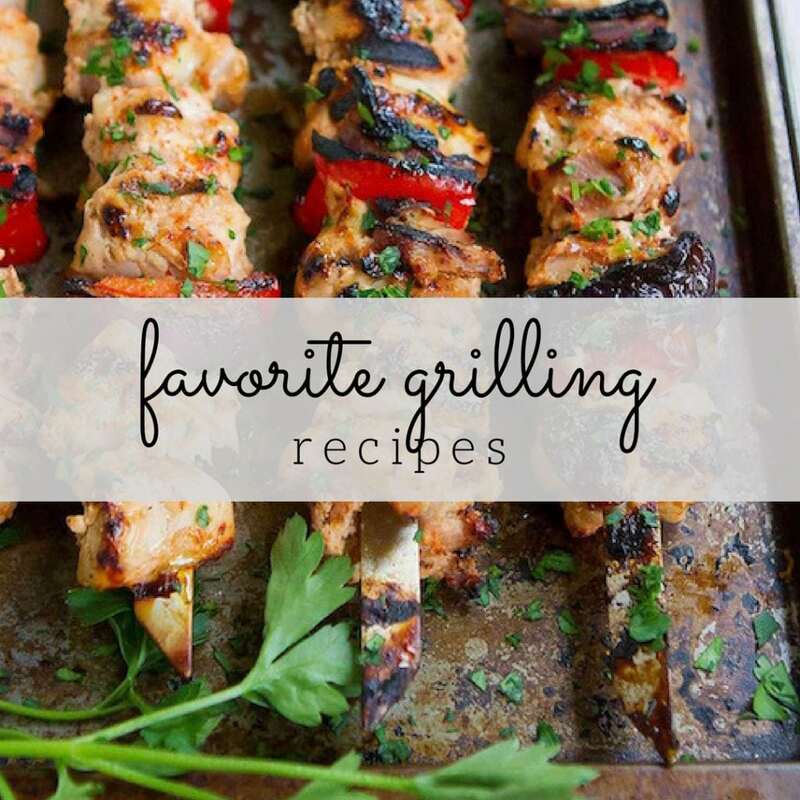 Looks SO flavorful! 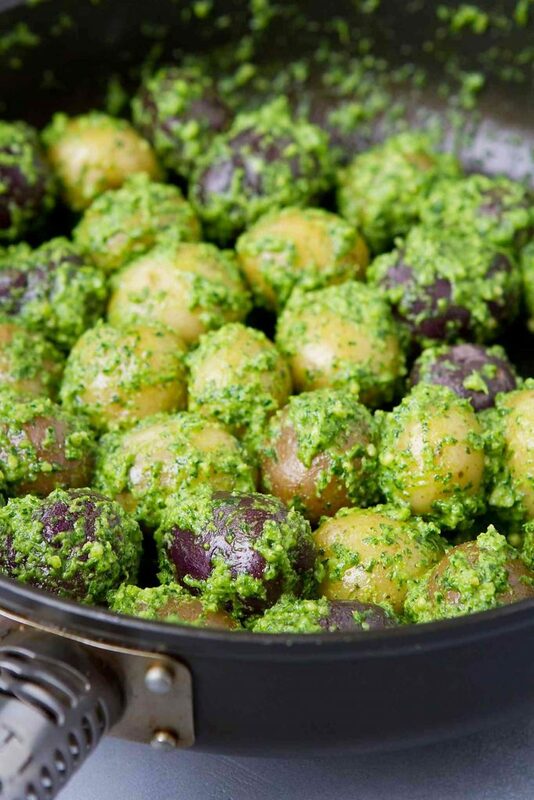 I love potatoes but I love that pesto paired with them even more! I am an unabashed cilantro lover, and come to think of it, I can’t resist potatoes, either. This is a match made in heaven! These potatoes are so very pretty! And they’d go well with so many dishes. LOVE. I could eat these all day long. I’m a sucker for little potatoes. Cilantro lime is the perfect flavour combination!